Cook rice with 1 cup of water and a pinch of salt for about 20 minutes. Sauté onion and garlic until translucent. Add meat and cook through. Add 1 tbsp of tomato paste and 1/4 cup water. Season with salt and pepper. Let cook until all liquid is absorbed. 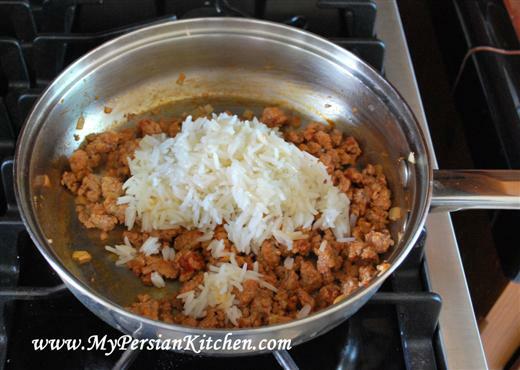 Add rice to the meat and mix well. 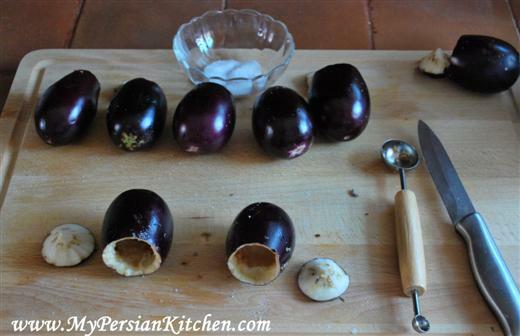 In the mean time remove the pulp from the inside of each eggplant. Season the inside with salt. 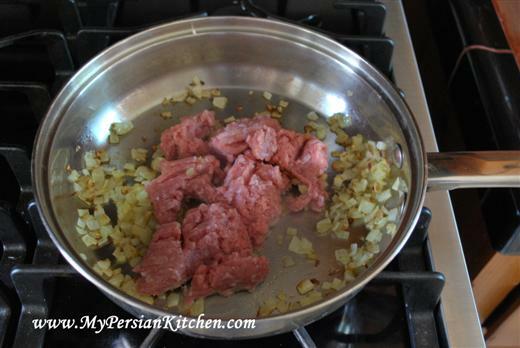 Add herbs to ground meat and rice. Add advieh and check to see if more seasoning is needed. 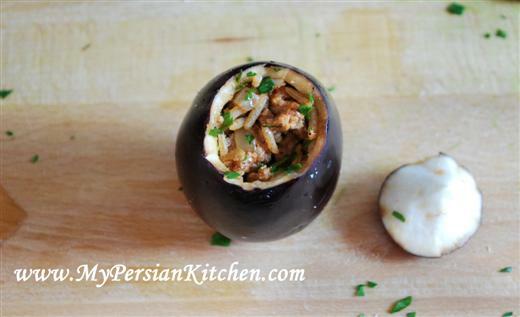 Stuff eggplants with ground, rice, and herbs. Place the lid back on the top of eggplant. Arrange eggplants in a pan where they can stay vertical. 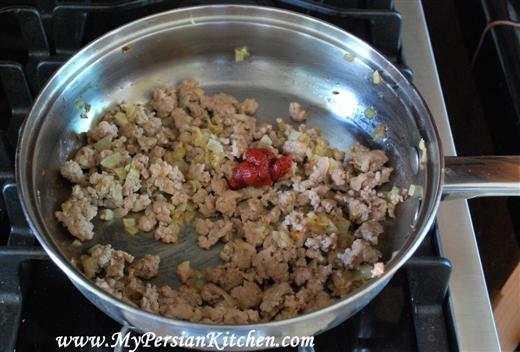 In the same pan that the ground meat was cooked place 1/2 cup water, 1 tbsp of tomato paste, and 1 to 2 tbsp of lemon juice. Season with salt, bring to boil and let reduce for a couple of minutes. 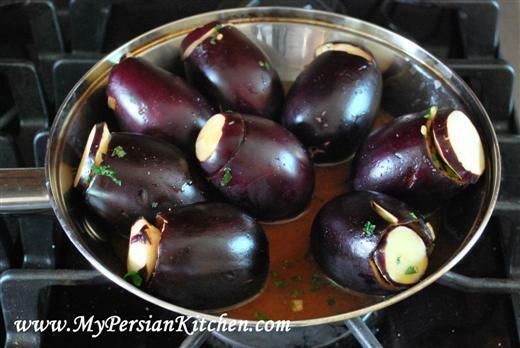 Pour sauce over the eggplants, cover, and cook on medium for about half hour or until eggplants are cooked. Looks amazing! Those eggplants are just perfect. I’ve had dolmeh hundreds of times, but never with bademjan. Noosh e jaan! O my! I need to try this right away! Wow! I know what I’ll be having on the weekend! love dolmeh bademjan! 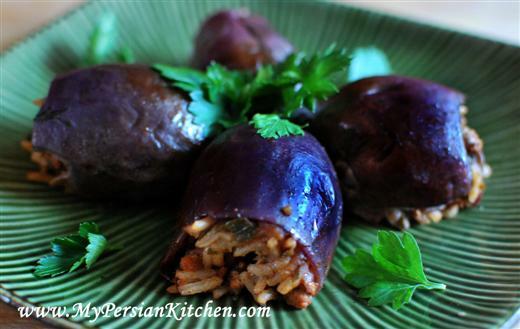 these look so good and delicious…and these eggplants are just perfect for dolmeh. yummy! I made the same thing last month, but the eggplants tasted bitter, good thing i only made 4! I wonder if I could get some response to what others think about this. Recently I have been learning how to make ‘Abghoosht’. However, my version is very differnt. It is light with just red meat, bacon and chick peas and spices necessary. Humorously I call it the Persian Beef Bourguignon, the difference being instead of pouring the wine in, you drink the wine. I am planning a big dinner party this weekend. I am planning to make these two dishes and various salads and side dishes in case somebody does not like red meat or chicken. What do you think? Would you be happy to sit at that table? I am putting a menu together and would love to hear what others think. My partner has tasted those two dishes separately and he thinks they go great together and offer choices to people who like poultry, meat or both. Nobody? Nobody has anything to say? I expect more passion and opinion. In my opinion, it depends on your guests, if they are willing to try new foods and they don’t mind tasting them, go for it. But if you think you might have some unhappy guests at the dinner table, add another common dish to your menu so every one can enjoy your party. My family used to have big parties every weekend. And my mother, being a clever woman, when she wanted to make a new dish she would only make a small amount, and added to the menu. If the guest liked it, they would asked for the recipe and made it in the next gathering, and if they didn’t, there was plenty of other food to choose from. O., I have to first say that I agree with Mahnaz in the fact that it depends of your guests. I would not dare serve the dishes that you described to Persians who are excellent home cooks because I know they would mock me to no end. I am an advocate for experimenting and letting your creative juices flow in the kitchen. I would most definitely love to see the pictures of your dishes. It’s hard to simply imagine with words. 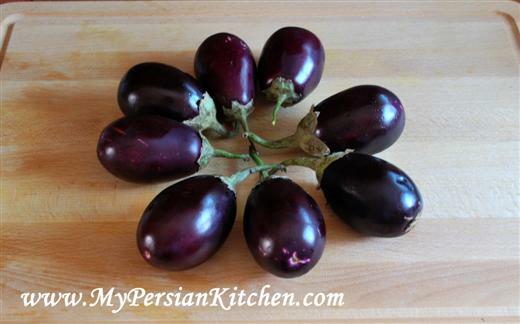 Feel free to post them on My Persian Kitchen’s Fan Page and ask the rest for their input. Good luck with your dinner party!! There is such a plethora of flavors in every mouthful…. this dish is to die for! Lovely and delicious as always. I do a similar dish where the rice and meat aren’t cooked when they go into the eggplants, so everything cooks together. 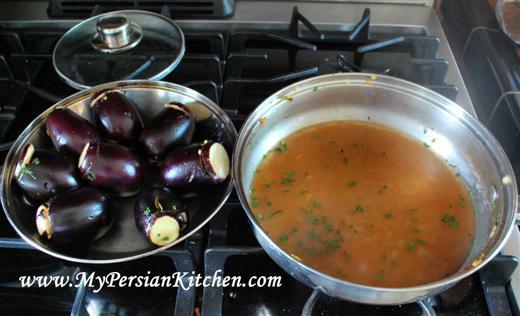 It requires using more sauce and broth to submerge the eggplants. I will definitely have to try your method to see which I prefer. Like you I LOVE the tiny baby eggplants. They’re so cute and flavorful. And it just occurred to me that this is a good use up dish for leftover cooked rice and/or for when you have a bit of extra ground meat laying about. Awesome work as always! Hi, i was wondering what would you substitute the beef for to make this veggie? I have my both hands rised!!! It is my favourite food on the same place with Khorest Bademjan and Mirza Ghasemi. 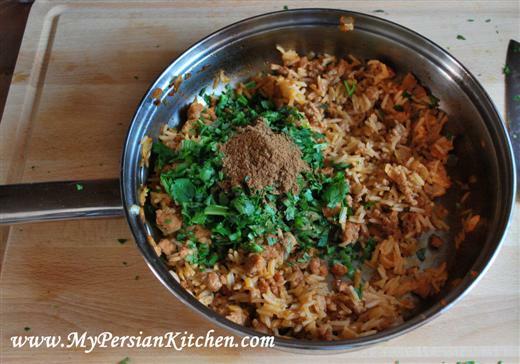 Your website is extraordinary and i have to thank you for teaching me to cook Persian food. My husband is Iranian and i love to cook for him. Cristina, welcome! I am happy that you have found MPK and that I can be of help!! This recipe looks so delicious. What do you do with the flesh you remove from the inside of the eggplant? Do you just throw it away? Would it ruin the recipe if I add it to the stuffing mix? Can you recommend an alternate use for it? I hate to waste food. Thanks. M Mobarak, I save mine and make other things with it. I sometimes make Kuku with it and other types I just saute it with other veggies. 3 pages!!! most of which were blank. Disappointing! !